Traveler For Good: Holy Soley! "If they can make penicillin out of mouldy bread, they can sure make something out of you." See - you feel better already. You know you're better than a green heel of bread. Want to know how you can feel even better? 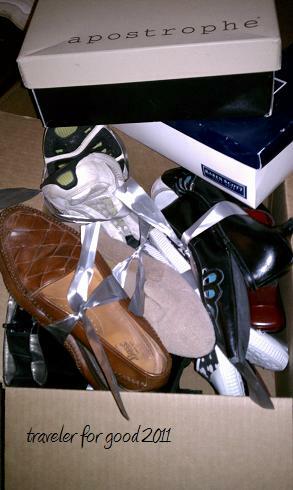 By donating shoes. My sister, along with her coworkers, have been champions of shoe driving this past week. She showed me the trunk of her car after work today and all I could say was "HOLY SOLEY." 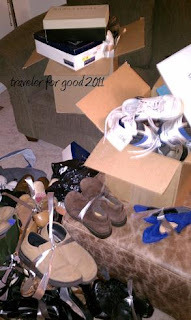 You can go on international volunteer trips to distribute shoes. You can see the actual difference a pair of shoes can make. I love to travel. It's what prompted me to start my blog in the first place. I've done a variety of international volunteer trips in the past 6 years including going to Mexico with the Whitewater Presbytery as well as with Healing Waters International. I went to Thailand with Cross Cultural Solutions. Last year I (and over 50 highschoolers) worked with Habitat for Humanity in Guatemala. Going on a trip with S4S will hopefully be something I can do in 2012. Keep your fingers crossed. Traveler's 6 Step Guide to being a Flippin' Good Person! 1. Gather your pre-loved shoes. Tie each pair together, either with the shoelaces or with a rubber band (or silver ribbon...whatever you have on hand). I was looking for a motivational quote about shoes to end this post with. And then I saw this (source unknown): "Arithmetic is being able to count up to twenty without taking off your shoes." There you go. Have a great weekend!